Got out on the water this morning before 5am to catch bait. Hung a lantern on a bridge to attract Herring and went to hit some lighted docks. On my first throw of the cast net the net froze to the side of the boat [14* this morning] . Next throw the net was frozen so it did not open properly. Ended up having to dip my net in the lake before every cast just to get the net to open. Moved back to the bridge to throw on my lantern and could not get my trolling motor to go into the water, it was compleatly frozen. 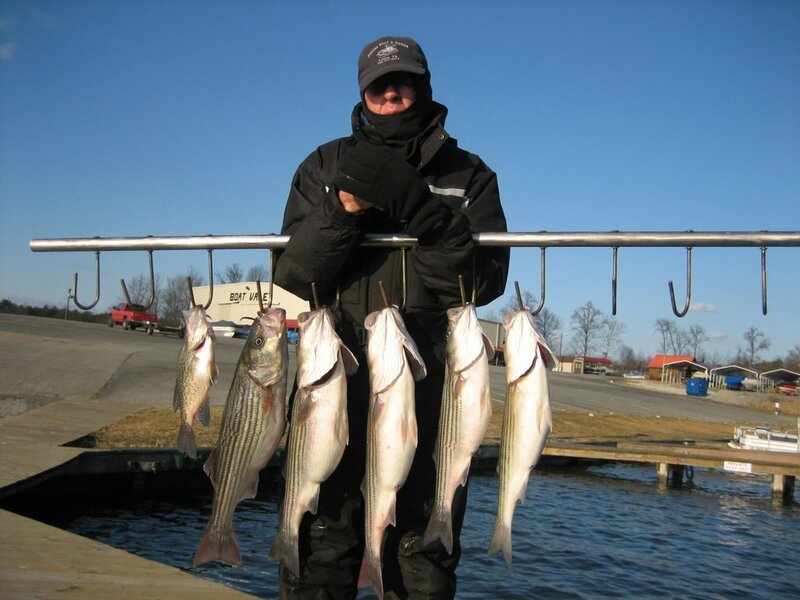 After struggling to catch bait I picked my clients up and went just a short distance from the marina so they would not freeze in a long boat ride. I put out my spread [6 downlines , 6 planner boards and a bobber rigged with Herring and Threadfin Shad, running deep points with large schools of bait on them. We had 3 hits in the first 15 minutes, 2 on downlines and 1 on a board, without hooking up. 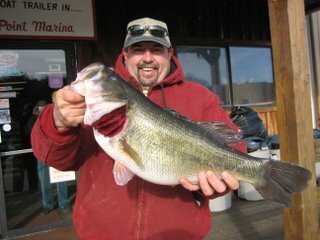 After 5 more minutes we hooked up on a board with a Herring and bob caught a nice Bass, 8lbs 14ozs. Ran another 200 yards and caught a Striper and decided to go back to the marina to check the bass in for a Citation. Went uplake to fish an area I caught fish 2 days before but the water temperature had fallen 3 * and all the bait we saw was in the channel. We fished it anyway due to the depthfinder showing so many fish but could not get any strikes. I decided the water temp. was too cold so we ran back downlake till we found the water temp. at 45* and put the spread out over some 20'flats. 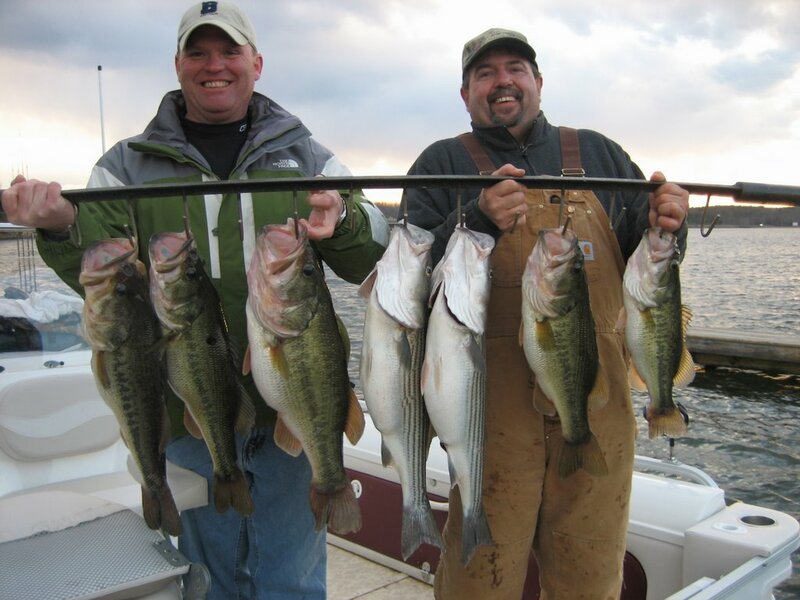 We started getting hits and within the next 2 hours boated some nice fish. Ended up the day having only 14 strikes catching 2 Stripers and 6 Bass. Although Bob got a Citation for his 8.14, we missed out on 2 more Citations by 1/4 and 3/4 of an inch. After measuring the Bass I told Tom his fish was too short for a Citation, he commented "I 've been told all my life I was a little too short'. January 23, 2007: Sunny and cold, Water 45* and clear. Caught Herring at daylight and started looking for fish at the Splits. Saw a few groups of Stripers around bait at 25' so we put out 8 downlines in their face but the fish were reluctant to hit. 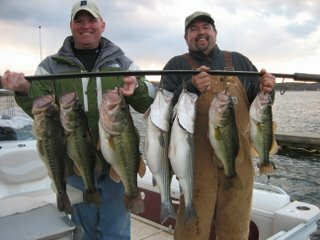 After fishing them for 30 minutes we put out planner boards and a bobber, running 14 lines covering from top to bottom. Worked the area for 2 hours catching only 1 Striper and a 2 pound crappie so we picked up and went further uplake . We located an area of about 10 acres that was solid bait and fish so we put out the spread and worked them for the rest of the morning. 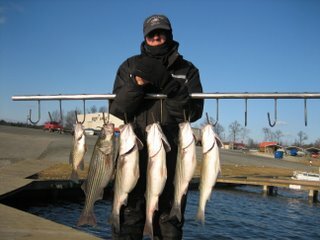 The Stripers were very lethargic and we only could catch 6 this morning, maybe due to the cold front and the bluebird skies. We kept 5 Stripers for dinner and the freezer. Ran uplake and started pulling herring on boards and downlines over 20' flats and working up onto 8' flats. Worked from the 522 bridge on the Anna arm down one side to Holiday Mill Bridge, up into Christoper Run and all the way back up to the 522 Bridge again on the other side of the lake. 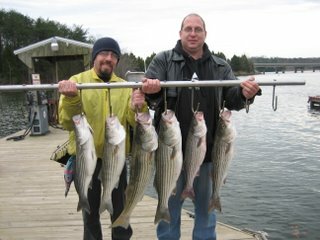 We had 14 hits today, all on boards, clients keeping 6 Stripers. Spoke to 2 other fisherman today on the radio, they catching only 1 fish between them. Hopefully the weather will straighten out and the fish will turn on. We saw fish all day long on the depth finder and could not get them to bite.